One of my first posts on affiliate marketing in what will be a series of posts on affiliate marketing on this blog, and I’ll try to cover the basics of setting up a successful affiliate marketing business in this. I intend to cover many other topics related to affiliate marketing in successive posts, so watch this space. This particular article though, will be more of a 101 on affiliate marketing, but I’ll dwell into some of the more technical stuff later on. You’ll probably come across a ton of different ways that affiliate marketing is defined on the internet. Here’s how I do it: Affiliate marketing involves individuals or organizations (knows as ‘affiliates’) promoting another company, business, organization or brand’s (referred to as the ‘merchant’) products and/or services through different avenues, and earning a commission on each sale. 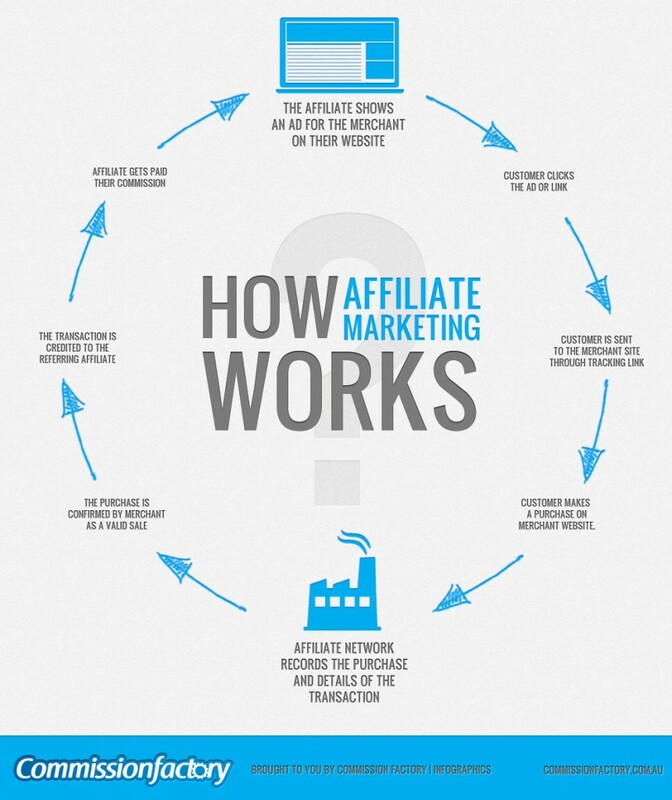 The great little infographic on the right actually does a pretty good job describing the different processes involved in affiliate marketing, and how the whole thing works. Click to enlarge the image. The benefits for both parties are quite obvious. Merchants are able to maximize their sales for virtually no extra cost or overhead (such as marketing costs) by offering affiliates an incentive, which is usually a small percentage of each sale that is made through the affiliate’s marketing efforts. From an affiliate’s perspective, affiliate marketing is a great way to earn online, and if done right, can be quite lucrative. For instance even a single sale worth $1000 could bag the affiliate quite a bit of money, depending on the percentage offered in the program. The Merchant – the business, retailer, or the brand. The Affiliate – the publisher, which could either be an individual promoting the merchant’s products, or an organization. The Network: refers to the mechanism through which the whole thing works. The network acts as an intermediary between the affiliate and the merchant, allowing affiliates to choose from and participate in an affiliate programs. The network also determines the mode of compensation (more on this later), and hence includes tools used to track and monitor sales and performance, generate reports, process payments, etc. What it takes to start an affiliate business? A website or a blog, that’s it! One of the biggest advantages of starting an affiliate business is its relatively low start-up cost. The initial investment could be as low as nothing, if you opt to host your blog on a free blogging platform. However it is recommended to go with a self-hosted blog, preferably using WordPress. Self-hosted blogs provide a lot more flexibility, customization and options especially in terms of SEO and the ability to get more targeted traffic – something that is vital to your success as an affiliate. Other than that, you need a sound understanding of what your customers’ needs and what would appeal to their interests. You also need to be able to pull in a lot of highly-targeted traffic, so be prepared put your marketing hats on! How do affiliates promote the merchant’s products and/or services? The affiliate is usually provided with links to the merchant’s products/services. These are usually direct links, but can also be banner ads that the affiliate can place on his/her website. When visitors come on the affiliate’s blog or website and click on an affiliate link – usually of a product or a service that they might be interested in buying, they’re taken to a page on the merchant’s website where they are able to buy the said product/service. Affiliate links usually place a cookie on the customer’s computer, which are usually valid for an ‘x’ number of days. Any purchase made on the merchant’s website during this time earns the affiliate a commission on each of the purchase. Understandably then, affiliate marketing requires the affiliate to get as much visibility, exposure and traffic on his blog as he possibly can. Specifically, the affiliate needs a large amount of targeted traffic, as well as a high CTR and a high conversion rate. Affiliate marketers usually use a wide array of different internet marketing methods and SEO techniques to maximize their earnings. These include a different SEO (search engine optimization) techniques – specifically on-page optimization, off-page optimization and keyword optimization that is targeted towards getting organic (search engine) traffic, paid search engine marketing, social media marketing, email marketing, content marketing, as well as writing product reviews and informative articles, to name a few. Most affiliate marketing programs out there function on a per-sale model (pay-per-sale or PPS) – whereby the affiliate earns a fixed percentage of each sale that he/she makes. The Amazon Affiliate Program for instance – one of the most popular, successful and widely-used affiliate marketing program out there – functions on a similar PPS (pay-per-sale model). 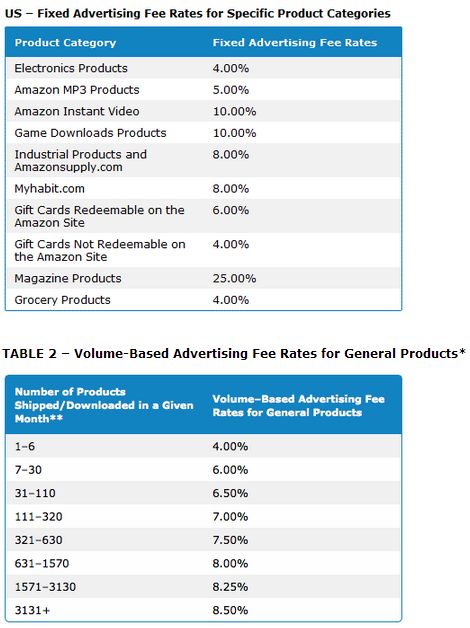 The Amazon affiliate program actually switches between a volume based payment model and a category-specific payment mechanism for different products, as illustrated in the table below. Some affiliate programs also use other compensation methods, such as cost-per-click (CPC), cost-per-action (CPA), or a cost-per-mille/cost-per-thousand views (CPM) based compensation mechanism to pay the affiliates. The PPS-based model though remains the most popularly-used one, by far. In the PPS or pay-per-sale method, the affiliate is paid on the basis of the number of successful transactions he/she makes, when the transaction completes. A sale generated through the affiliate’s efforts, the visitor is directed to the merchant’s website, and a ‘successful sale’ is only counted at the end of the sales process, which usually ends when the customer purchases the product by making a payment – at which point the affiliate earns the commission for the sale. Internet cookies, unique to every affiliate, are generated and used to track the movement of buyers so that sales can be attributed to each affiliate. Well, for starters, there’s the aforementioned Amazon Affiliates – a program widely regarded as the best in the business. It is also the only one I have experience using. However here is a list of 10 of the best, most popular affiliate programs out there, compiled by ProBlogger. It certainly appears so! This Guardian article for instance is a good example of how affiliate marketing can be quite lucrative. Like many of the other forms of online earning, affiliate marketing certainly isn’t some get-rich-overnight scheme. It can take a while before things get going, especially in terms of money. But like the article above, you’ll find plenty of examples on the internet of affiliates promoting products as their day-jobs, and where people are making big bucks as full-time affiliate marketers. It isn’t easy by any means to set up a successful affiliate marketing business. It takes time, perseverance, the right knowledge, access to the right set of tools, patience, maybe even a bit of an entrepreneurial knack and business know-how, but it is certainly possible to make some serious money as an affiliate, and maybe even quit your day job down the road! For me, the key to success for any affiliate is his or her ability to pull in highly-targeted traffic. The more, the merrier! And of course, good marketing skills don’t hurt! We will speak in detail about how affiliates can accomplish this in a future post on this blog, so stay tuned. Are you an affiliate marketers, who’s just started off or been in the business for a few years? Do you know any successful affiliate marketers? Do share your stories and thoughts with us in the comments below!